Welcome to the Official Untamed Youth Web Site! 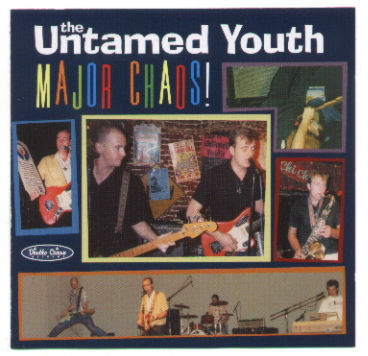 The latest Untamed Youth news, including info on the new LP, Major Chaos!! Untamed Youth records, including a little info about Deke's new record with the Ecco-Fonics and (of course!) the Untamed Youth's latest album. Also, the UY discography! Try the Untamed Youth Hist-O-Matic®! New Youth album out now!! You can order this fine recording directly from Double Crown! Do it today! Phew! Now that the year 2000 is safely behind us we can finally update the site without worrying about triggering some nasty bug that would take out the world's power grid (or at least idle the Pabst Blue Ribbon brewery). Well, I've been busy as all heck with my new band, Deke Dickerson & the Ecco-Fonics! We've toured the USA and the world this year--we just returned from a tour of Europe with Link Wray! That was a lot of fun. We also have two new CD's out this year. Our new studio album is on Hightone/HMG records, and it's called Rhythm, Rhyme, and Truth. Also I recently put out a CD compilation of all the Ecco-Fonic singles. There are 14 songs on there by myself, and 17 by other artists that have recorded for Ecco-Fonic. The compilation is called This is Eccofonic. If you'd like to see what else we've been doing, or if you want to order merchandise, check out our web site at http://www.dekedickerson.com. Alright, thanks you guys and hopefully we'll see you at an Untamed Youth gig sometime this year! Steve "Sammy" Rager here. Well it wasn't exactly the most eventful year for the Youth, but each of us kept busy nevertheless. I made the trek to Las Vegas Grind #2 back in June and had a really swingin' time! It was great seeing folks from all over the world diggin' some of the coolest bands of the past 35 years. The Remains still definitely RULE! The Swingin' Neckbreakers rocked as hard and possibly better than any time I'd ever seen them, and that's sayin' plenty! And it was great to rock out again to the Lyres. Mighty fine, indeed. I also got the chance to check out Deke's Eccofonics band whenever they passed thru town. And it was great seeing Joel in St. Louis behind the kit for new country (and "Brown Sound") sensation Neko Case. Personally speaking, I'm not playing in any local bands. I don't wanna go around knocking Columbia, MO, but the scene has been sinking to a new low in recent months. Actually it's been years since local bands got any kind of support in these here parts. In fact, it would be fair to say the local scene began hitting the skids about 10 years ago when Deke and Mace packed their bags for sunny southern California. It's never recovered. These days, even cool national acts like Wayne Hancock, Big Sandy, Kim Lenz, etc, barely draw a decent crowd. That's a lot of the reason why Mace and I don't bother playing in bands. It's just not worth it. And trying to find like-minded musicians ain't no picnic, that's for sure. But I haven't exactly stashed the Farfisa in the musty basement amongst the spiders and cobwebs either. I still practice, more lately than in a long while. This year though, I've been playing my Wurlitzer Electric Piano more than the organ. I recently found a new one (well, a new used one), while visiting my old stomping grounds of Peoria, IL, after wearing the other keyboard out. So I'm attempting to sharpen my skills, but in a different way. And for you Joel "Jet" Trueblood fans, he's gonna become a father too later this year! Hmm, at this rate the band might have to change their name to the Untamed Daddies! Also, Gearhead Magazine released a CD compilation of the singles they've put out with the mag over the years, and it includes the Youth's "My General Lee." Check out the special Las Vegas Grind Gallery! The Untamed Youth played an incredible set as part of the big Las Vegas Grind weekend in the fall of 1999!. Got any photos yourself? Wanna share them with your fellow fans by letting us put them up (with full credit, of course) here on the site? Kindly e-mail the Untamed Webmaster! If you saw the show but don't have any pix, e-mail your comments and we might add them to the Las Vegas Grind page! Also, the Youth would be interested in any video footage of their set -- again, e-mail the Untamed Webmaster if you've got any. Check out the "Drumming Siblings" article in Continental Magazine (#7) -- it features Joel "Jet" Trueblood and his sister Jill. The mag also includes a sampler CD that has "Since You Went Away," the recent Youth single. Speaking of Double Crown, don't forget their Trashmen tribute, out now, featuring the Youth doing "Bird Dance Beat"! Details here! As announced during Las Vegas Grind: It's true -- Deke and Mace are now step-brothers! Deke's Dad married Mace's Mom in Columbia at the end of October 1999. Music at the reception was provided by the Youth, natch. New photos in the regular Gallery from the 1995 reunion show, a 1989 appearance in Pennsylvania and more! Deke Dickerson & the Ecco-Fonics have released a new elpee. You also might be able to catch them on tour. Also, if you saw the critically acclaimed movie "Election" over the summer and thought you heard Deke, you did! He had a song featured in the movie, although unfortunately the tune didn't wind up on the soundtrack. Joel "Jet" Trueblood continues working with The Boss Martians and Neko Case. He'll be featured on some of the tracks on Neko's album entitled Furnace Room Lullaby, and he's on the Boss Martians' Dionysus release, Move. You can send e-mail about this site or anything related to the Untamed Youth to funk at juvalamu dot com. This Cowabunga Web Ring site is owned by Evan Davies.